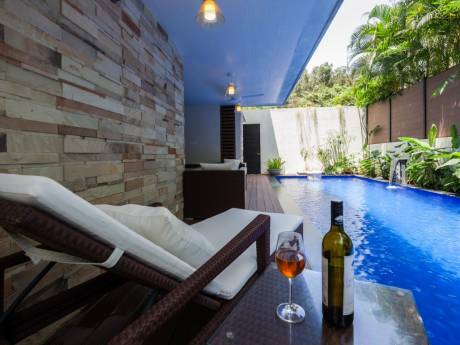 Luxury serviced villa with pool in select resort. It is only a 3 minutes walk to the beach. 24 hour security and management facilities. Close enough to all tourist amenities when you want them yet a home away from home when you change your mood. 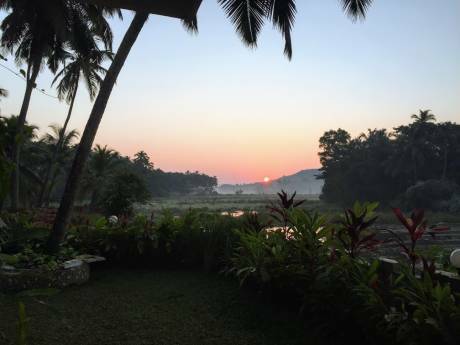 We normally rent this property during the peak periods, and as I spend the majority of my holidays travelling to India, I don't have much time for going on an exchange holiday elsewhere. However, perhaps something can be discussed, such as a couple of weekends somewhere in Europe for a week in Goa?! Residents can expect all the conveniences sought by the modern day tourists including the amenities of a 5* hotel literally in the next street, yet with the flexibility to switch into their own private world when it suits them. Our choice of this particular villa was fortuitous: it is spacious and there is a lot of natural light, a rarity in most Indian homes! The pool is shared with 5 other villas, but is not busy since there is a bigger swimming pool elsewhere in the resort which all other villa owners seem to use. The swimming pool and landscaping, although shared, usually pass off as our own private garden. We have even managed to host private parties around the swimming pool (management permission recommended). The villa is fully serviced, with the comfort of 24 hour security and assistance and the quality of maintenance is excellent, which provides the ideal balance between a home and a luxury hotel. The villa is not suitable for wheelchair access. Bedroom 1 with double bed, en-suite bathroom, air-conditioning and balcony overlooking swimming pool. Bedroom 2 with double bed, en-suite bathroom, air-conditioning and balcony. Bedroom 3 with twin beds, en-suite bathroom, air-conditioning and balcony. All 3 bedrooms have fully equipped en-suite bathrooms with bath and/or shower, western style toilets, washbasin, non-slip floor tiles. Additional wc adjoining the lounge downstairs. Kitchen: Cooker with oven and hob, microwave, large fridge, washing machine, dishwasher, full range of kitchen cabinets and all necessary equipment for a party of 6/8. Utility Room: Large utility room with ceiling fan connecting 2 upstairs bedrooms suitable for use as overflow lounge/study. Also capable of use as (non private) bedroom, subject to supplement for additional beds and linen. Living Rooms: L-shaped lounge and dining room with 3 Juliette balconies forming a feature at the front overlooking the swimming pool with adjoining landscaped garden and a large fountain feature running into the swimming pool. 2 ceiling fans. There is a large covered porch overlooking swimming pool and private patio opening out to swimming pool area and decorative fountain feature. Variety of fruit trees and landscaped gardens. Restaurant facilities, management team and 24 hour security on site. The villa is cleaned and towels and bedlinen changed weekly. Daily cleaning and linen service available for small extra charge (book with front office). Pool and beach towels available on request. Chef available for small extra fee (ask at front office). Internet access available at the reception (if you are a heavy user then local IT consultants can supply inexpensive gadgets for wireless access). In keeping with local customs, the living areas have ceiling fans but all bedrooms are air-conditioned. The villa is close enough to all tourist amenities when you want them yet a home away from home when you change your mood. There is a bar and al-fresco restaurant in the complex near the main swimming pool and also an excellent vegetarian restaurant on the perimeter of the complex (very good value for light take-away snacks and breakfasts). There are landscaped gardens throughout the resort (8 acres) for use by all villa owners. Gated security with premises patrolled 24 hours. Sinquerim beach is about 500 yards away and the section just outside the Fort Aguada resort caters for all types for water-sports. This opens out into Candolim beach. Calungate and Baga beaches are about 10 and 15 minutes respectively by taxi or bus. Large supermarket, shops and banks in Candolim. Small convenience store outside main gate of resort - open late. 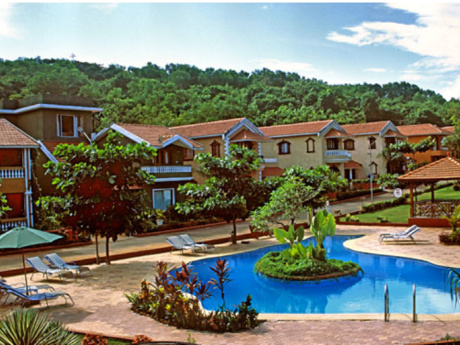 Fort Aguada beach resort 3 minutes walk. Bus stop right outside front gates of resort serving Candolim-Calungate-Mapusa stretch. Candolim shops 5 minutes by bus, rickshaw or taxi, Panjim about 20 minutes drive.